It’s not uncommon to hear that a senior has had an accidental fall. You may have experienced it yourself once or twice. As we age, we tend to assume that general mobility, balance and independence are greatly reduced and are a “part of aging”. Some assume that this change in function is inevitable and there is nothing that can be done. However, though the risk for falling increases with age for a variety of reasons, there is no need to assume that it is a part of aging and accept this inaccurate truth. Currently, falls are the leading cause of injury and hospitalization for seniors. Loss of independence, permanent disability and even death are potential outcomes from a fall. One out of three Albertans over 65 will fall at least once a year. One out of two Albertans over 80 will fall at least once a year. 79 emergency department visits each day in Alberta will be fall-related. 27 of those visits will result in a hospital admission. 95% of all hip and wrist fractures and 40% of all nursing home admissions are a direct result of falls. Falling costs Albertans over $288 million each year. Even if a fall has not led to hospitalization, there may be many costs to the patient and his/her family that are not covered by the health system. These include time off work to be with an injured loved one, costs of home care, medication and other out-of-pocket expenses. The financial consequences of falls are only the tip of the iceberg. 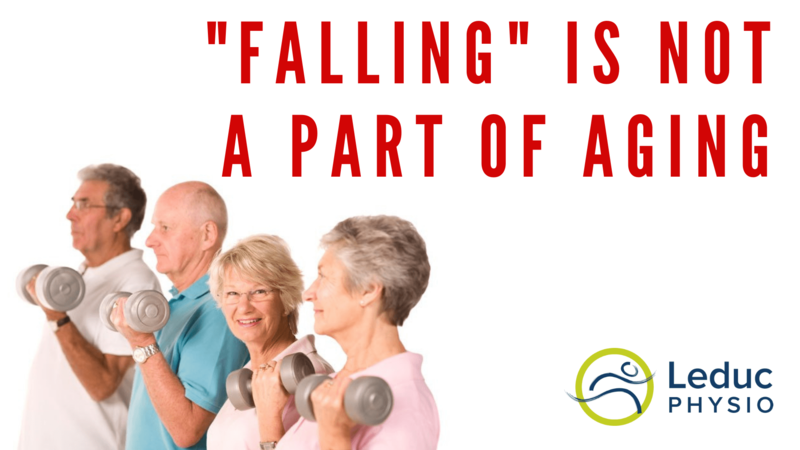 For many seniors a fall is the beginning of a process of decline leading to fear of falling and chronic pain. These can then lead to decreased independence, decreased participation in activities and, in many cases, the unfortunate institutionalization. The good news is that falls are not an inevitable part of aging! If you or someone you know could be at risk for falls, find out how they can be prevented. Speak to a health-care provider. Your family physician or pharmacist to review your prescriptions, over-the-counter medications, vitamins and any supplements you are taking. Research shows that taking medications used to manage sleeping disorders, anxiety, depression, and other medications commonly prescribed for older adults are risk factors for falls. Taking multiple medications have also been identified as increasing the risk of falling. Your eye doctor for a comprehensive eye exam to determine if there have been any changes to your eye health or vision. Eye conditions that reduce vision such as glaucoma, cataracts and macular degeneration lead to difficulty seeing at night or in very bright light and make it more difficult to judge distance and may increase your risk of falling. Your physiotherapist to assess for any changes in strength, balance or mobility that can affect your ability to move and remain active. Weakness, slower reaction time to sudden changes in speed or surfaces and difficulty with balance are all factors that affect your ability to move safely and easily. These physical factors can be modified with exercise and practice to reduce risk for falling in older adults. Whether you have already fallen or are afraid you are at risk for falling, research indicates that simple exercise and maintaining an active lifestyle can help. By increasing strength, flexibility and balance, regardless of age, you can decrease the risk of falling and can minimize injury and negative effects of a fall if you sustain one. Try to do 30 minutes or more of moderate to vigorous physical activity at least five days each week. If you are just getting started, build up slowly and add a few minutes each day. Include activities that strengthen both arm and leg muscles. Consider adding balance exercises and stretching for flexibility. If you’re nervous, or don’t know where to start, consult a physiotherapist for advice. Ensure you have proper footwear. Limit the amount of clutter, cords and furniture around your home or on/around stairs. Get rid of loose mats and use non-slip mats or rugs where needed. Be aware of where your pets are and watch out for them underfoot – they can be a cause of falls. Make your bathroom as safe as possible by installing grab bars in the shower or tub and around the toilet. Keep all floors dry and be aware of changes in flooring surfaces. Install and use handrails on stairs. Rails on both sides make stairs even safer. If this is not possible installing a stair lift may be appropriate. Choose stable chairs with arm rests and avoid rolling chairs or stools. Physiotherapy can help if you or someone you love has fallen, is at risk to fall, or is afraid of going out because of poor balance. Balance is complicated as it relies on strength, flexibility, vision and your body’s ability to tell where it is in space. A physiotherapy assessment can help to identify where balance problems lie and to develop a treatment plan to address these issues. Research shows that when patients see a physiotherapist about falls and falls prevention, they experience fewer falls and fall-related injuries and enjoy a higher quality of life. Falls can be prevented, and physiotherapy can help! Act to prevent falls: watch your step, be aware of and minimize risks at home or in the community and get active. Any of our physiotherapists at Leduc Physio can help you with this goal. You can book an assessment online at www.leducphysio.ca or over the phone at (780) 980-5443.